A few weeks ago we had a conversation right here on Insider Trading that we could see Lightning head coach Jon Cooper follow in the path of Barry Trotz where you win the Stanley Cup and then move onto another team during the off-season. 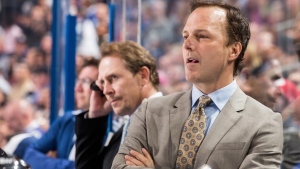 One thing we do know for sure is that while he could still win the Cup, Jon Cooper is not going anywhere. LeBrun: Yeah and all we knew at the time was that his deal was expiring and that both sides wanted to get the deal done. But, you have to meet in the middle somewhere and they finally did. It's clearly important for Tampa and for Jon Cooper not to have this hang over the playoffs like it did a year ago for the Washington Capitals and Barry Trotz. For everyone to say that it didn't affect Washington because they ultimately won the Cup anyway, well it did. They lost Barry Trotz. So this was important for both sides. Now, no details released as to what he is making now. His current salary is $2.25 million on his expiring deal and I've talked to some people in the NHL coaching fraternity who believe that his deal is worth north of $3.5 million a year which would put him among the top six or seven paid coaches in the National Hockey League. McKenzie: And still widespread uncertainty as far as a lot of coaching positions go. There are still officially six vacancies where they right now do not have a full-time head coach. 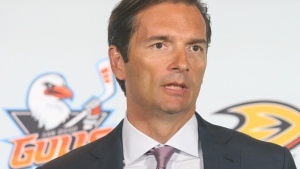 In Anaheim, Dallas Eakins is considered a leading candidate in Anaheim. But there is expected to be a thorough search conducted post-season. The Edmonton Oilers I think is more focused on getting the new GM before choosing the head coach because the GM would do that. Lots of speculation in Los Angeles that maybe Todd McLellan would be a leading candidate there but nothing firm by any means. The focus in Ottawa now seems to be shifted to the team president hire but absent of that, I would think Pierre Dorion, the general manager, is going to start the search in earnest once the regular season is over. Scott Gorton, the interim head coach in Philadelphia, has rocketed up the charts. A possible full-time head coach. But, I think the Flyers still want to consider all of their options. Especially, of Joel Quenneville is a possibility. And finally, Craig Berube is quite likely to lose his interim head coach position if Quenneville wanted a St. Louis homecoming. So those are the six vanacies that we're aware of. Are there any other spots we should be watching? McKenzie: I think [there] are three what you would call potential hotspots. The Buffalo Sabres. 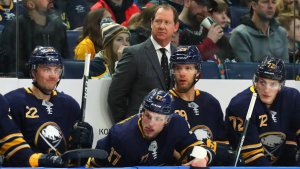 Jason Botterill, the general manager of the team, was on record three or four weeks ago saying 'Phil Housley is my guy, he's not going anywhere.. I don't know that anything has necessarily changed on that. But you still have to wait until the end of the season for an official vote of confidence. In Florida, general manager Dale Tallon is basically espousing the old, 'We're keeping all of our options open, we're evaluating all options at the end of the season.’ That may not be good news for head coach Bob Boughner. There's lots of speculation that potentially a change could happen there. A lot of people will want to try to tie Dale Tallon to Joel Quenneville. They were together in Chicago. The third spot, Minnesota, right now the focus is trying to make the playoffs but people wonder about Bruce Boudreau under long term general manager Paul Fenton, who did not hire him. Boudreau has a year left on his deal as a head coach and two more years as an adviser, he may not be in a hurry to pay money to a guy who's not the coach. New York Islanders fans are still a little bit sour about losing their captain last year. John Tavares heard all about that in his return to the Island. 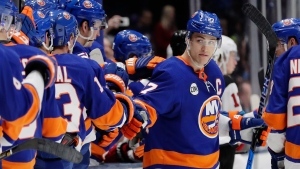 Could the Islanders lose another captain this off-season? LeBrun: It is interesting. Anders Lee has not yet signed a contract extension. And believe me, he wants to sign one. Lou Lamoriello, GM of the Islanders, says it remains a top priority to get Anders Lee signed. My understanding is there has been dialogue, on-again-off-again really since the start of the season. Neil Sheehy, Anders Lee's agent, has been spotted at Islanders practices, skates and games five or six times since October and my sense is Sheehy will be there before the end of the regular season again to take another stab at this. Why hasn't it happened? I think it's term. 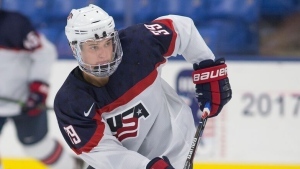 On the Anders Lee side, they want seven or eight years. On the Islanders side of things, obviously below that. McKenzie: Speaking of the Islanders. Oliver Wahlstrom, the first-round pick from last year, has informed Boston College that he is not going back to school so he's obviously going to try and negotiate a deal here with the New York Islanders in the immediate future. Plan B if he didn't get that deal done, he's got some options on the table in Europe. So, keep an eye on Oliver Wahlstrom to see where he ends up.